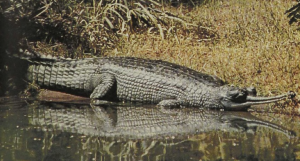 The Gavial or Gharial is a large and specialized crocodile once occupying the great rivers of India, Pakistan, and Upper Burma, but now having a more spotty range. These slender animals exceed 19 feet in length, being one of the longest of the reptiles. Some fossil species, known mainly from skulls, must have been almost 60 feet long. In males the tip of the elongate snout is capped by a balloon-like nasal flap. The snout is extremely narrow and consists of little more than four rows of interlocking teeth (two upper and two lower) and an armored air passage. It serves as an efficient fishtrap when utilized for sideways snaps at schools of fish. Once caught by the tip of the jaws, a fish is likely to be tossed into the air, being moved backward with each toss until it disappears headfirst down the Gavial’s throat.